Book Drunk: Review ~ Twitter Girl by Nic Tatano. Publication Date: September 18, 2014. 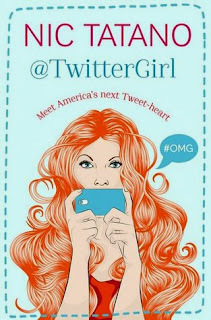 The idea of Twitter Girl really appealed to me and it was as funny as I had expected it to be. Cassidy, known as @TwitterGirl to over a million of her Twitter followers, has been fired from her job for a controversial tweet taken too far. Not down and out for long, she is soon hired to help Will Becker in his presidential campaign by doing what she’s best at – creating a bit of a Twitter storm. I loved the concept of this book involving Twitter, something most of us are now familiar with, but also how it wasn’t overdone. Not every page was filled with tweets because there is, apparently, moments in life where people aren’t tweeting. Cassidy’s new job looked perfect for her – the use of sarcastic tweets in a political campaign felt completely fitting and her humour was a joy to read. I loved our main character Cassidy. Though she was built to be snarky and very sarcastic as Twitter Girl, it was her quick wit and humour that was really endearing. She was faultlessly caring and devoted and she had a huge heart. Her tweets had me smiling a lot and I loved seeing the progression in her character throughout the story as we see her character grow and her personality really shine through. I liked the journalistic side to Cassidy and how, even though she’d lost that job, her interest was always piqued by the chance to follow a lead. Maybe she had more morals than the typical journalistic character but it only made me connect with her more. And she definitely had the know-how and the attitude to wipe the smiles off of any snide people she came across. Nic Tatano’s creation of characters was wonderful. He mixed in some loveable characters along with typical politic type characters that you’re suspicious of, with or without reason. I loved Ripley, Sam and Tyler and Cassidy’s individual relationships with them all. I adored her brother Sam. He was brave in the face of his health problems and a total sweetheart. I loved how much Cassidy trusted him and he was a great support unit for her. Reading their dialogue and the banter between them were some of my favourite moments in this book and I enjoyed it when Ripley was involved too because Sam knew them both so well and was not afraid to laugh at some of the decisions they made, as well as being there to pick up the pieces if they needed him to. Cassidy’s colleague Tyler was also a favourite of mine and as much as I liked reading his late night conversations with ‘T.G’ and his character become more involved in the story as it went on, I completely loved his growing friendship with Sam. Cassidy may have been the star of this book but I thought the male characters were brilliant to read too. Twitter Girl took me a little bit of time to really get into, and used to some of the politics talk, and right towards the end it did become a little too cheesy for me, but I completely loved the rest of this novel as it provided lots of laughs and entertaining moments. It was a charming, romantic story but something a little different too. I loved Cassidy’s investigation into the anonymous tip-off she received about Becker and there was a twist or two I really wasn’t expecting. Lots of sass and lots of fun, this book did not disappoint and Nic Tatano is an author I’m hoping to read more from, although I think it will be difficult to top Twitter Girl! Love the cover of the book and the title. It sounds like by your review a great book to read during a need to chill and relax time. I imagine it was funny in places. The cover's gorgeous! It's a lovely light-hearted book, fab characters too.